Goodbye IEEE 802.11ac; hello Wi-Fi 6. As announced at Samsung’s Unpacked event in February, the new Galaxy S10 is the first mobile device to support the new, whip-fast Wi-Fi 6 standard, promising significantly increased wireless internet speeds. But what is Wi-Fi 6 exactly? What does it mean for your business? How do you prepare to take advantage of Wi-Fi 6 data speeds without compromising security? Read on for everything you need to know about the new standard in wireless internet. Wi-Fi 6 is the name of the latest Wi-Fi standard that will be incorporated into the next generation of wireless access points, smartphones, tablets and eventually thousands upon thousands of Internet of Things (IoT) devices. Wi-Fi standards are governed and named by the international Wi-Fi Alliance. The technical name for the new standard is “IEEE 802.11ax,” but with this rollout the Wi-Fi Alliance has adopted the simpler title, “Wi-Fi 6” — a reference to its historical position as the sixth Wi-Fi standard. Businesses will care most about the advancements in broadcast capacity, resulting in faster connections. While fifth-generation Wi-Fi networks — the ones you’re most likely using currently — broadcast to one device at a time, resulting in slowdowns when multiple devices connect, Wi-Fi 6 access points broadcast to multiple devices simultaneously. Wi-Fi 6 also offers a target wake time feature (TWTF) to better preserve the finite battery life of mobile devices and other IoT endpoints, as outlined in research published by the Institute of Electrical and Electronics Engineers (IEEE). Wi-Fi 6-compatible routers build on many of the same Wi-Fi technologies used in the fifth generation. These include the 2.4GHz and 5GHz bands used today, but in a way which supports higher-speed data transfers over each band. The Wi-Fi 6 difference will become clear to mobile device users when it comes to high-bandwidth applications like video streaming, especially in high-congestion scenarios. Research cited in TechSpot suggested that Wi-Fi 6 can deliver a lift of four times more data per user than Wi-Fi 5, even over long ranges or in dense traffic, like a busy stadium, conference or crowded hotel. IEEE has designed Wi-Fi 6 to be maximally compatible forward and backward. Practically speaking, this means that most existing infrastructure will work — you don’t need to update all of your networking gear. Taking advantage of Wi-Fi 6’s potential requires only a few component upgrades — Wi-Fi 6 routers, access points or switches and, of course, compatible endpoint devices, such as the Galaxy S10. Out of these components, compatible devices are actually the most necessary. Because of backward compatibility, your company will benefit from updating routers and switches and see faster speeds, but you’ll still see a partial increase in speed even with your old gear. Once you do upgrade your router and switches, you can enable battery-saving benefits and stronger traffic management on your enterprise network. However, any high-quality Wi-Fi routers which are generation 4 or newer can enable Wi-Fi 6 smartphone users to unlock the benefits of Wi-Fi 6 speed with a compatible device. While newer router equipment generally offers holistic benefits for network security and visibility, a Wi-Fi 6 device is all that’s needed for users to access blazing-fast data transfer speeds and HD streaming. Transitioning to Wi-Fi 6 is not going to be a Big Bang implementation, however, and you can upgrade your routers gradually. What Does Wi-Fi 6 Mean for Your Business? Mobility has changed the way we think about productivity, especially for businesses that serve large crowds of people who are moving about, ranging from festivals and stadiums to large hospitals or campuses that work with a heavy load of data. Wi-Fi 6 can enhance the latest generation of mobile devices to create secure connectivity by offering better speeds, bandwidth and battery life. 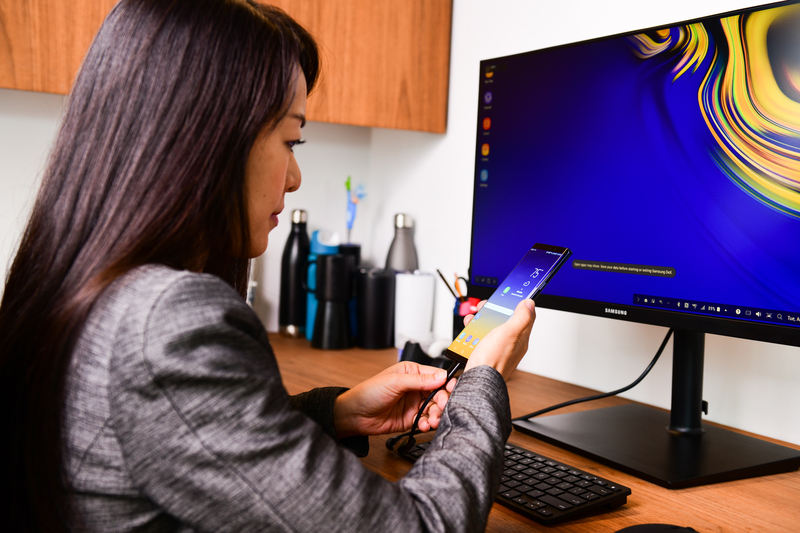 When combined with the intelligent performance, security and productivity features of the Galaxy S10, it’s a serious benefit for enterprise businesses looking to future proof and scale their capabilities with communication and networking, whether that means supporting a large crowd, making use of sensors to optimize your company’s overhead costs, or moving data at lightning speeds across your campus, all with much lower power requirements and congestion. There’s no shortage of ways that Wi-Fi 6 can benefit your mobile workforce, from the coffee shop to the airport. When Will Wi-Fi 6 Be Widespread? New Wi-Fi 6-capable equipment is just starting to come to market. If you’re planning to upgrade your networking infrastructure, now is the perfect time to start future-proofing your investment with new technology. Expect to see the availability of Wi-Fi 6 equipment increase momentum over this year, entering the mainstream in 2020. A successful, Wi-Fi 6-enabled mobility deployment starts by finding the right smartphone for your business and employee needs.